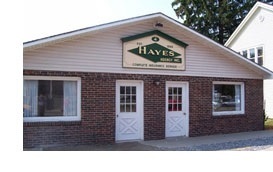 Hayes Agency Inc. is one of the leading, privately-owned independent insurance agencies in central New York. Our roots go back to 1898, when William Hayes started writing property and casualty insurance out of his home in Tully. Today, Hayes Agency continues this proud tradition of selling property and casualty insurance and we now are located at 4 Clinton Street in Tully, NY. Hayes Agency’s status as an independent insurance agency is important to you because it means that we are not as obligated to our carriers as we are to you, our valued customers. Our recommendations are made with your best interests at heart and yours alone. Hayes Agency clients can expect the personal attention they deserve as insurance consumers. Whether we are meeting with you face-to-face, listening to your needs closely over the phone or helping you to deal with a claim or billing issue, the staff at Hayes Agency will go the extra mile to make sure you are taken care of in a professional and timely manner. Hayes Agency has never strived to be the biggest agency in the area but rather the best agency to meet your needs. Most of our relationships are with customers living and working within a 50 mile radius of our office. Serving Tully And Its Surrounding Communities Since 1898.